This cartoon by Dave Brown from The Independent is based on the painting Canoe in the Rapids by 19th century American landscape painter Winslow Homer. In Dave Brown's version Angela Merkel, Nicolas Sarkozy, and Silvio Berlusconi (a passenger without a paddle!) 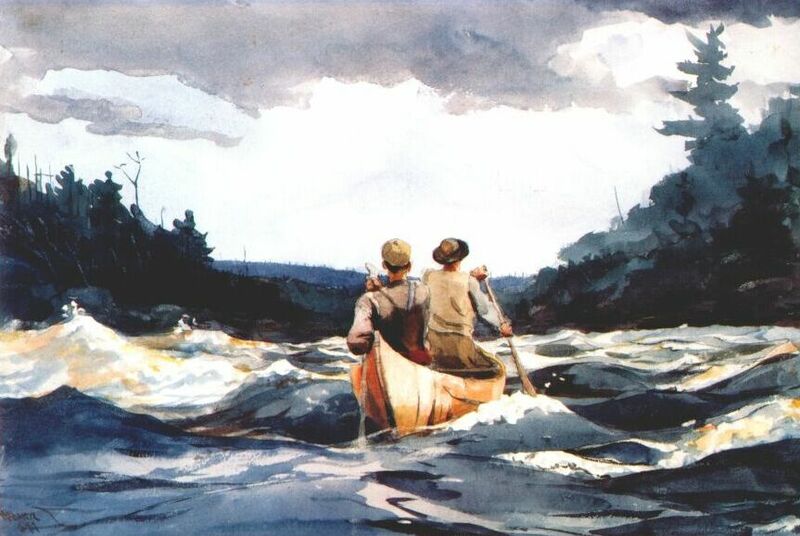 are in a canoe which is about to go over the rapids—a metaphor for the eurozone debt crisis. UK prime minister David Cameron is in the back of the canoe, which has broken off. Cameron is giving the thumbs up, a sign that everything is fine. Britain, having decided to keep the pound, is not part of the eurozone, which is why David Cameron looks so pleased. He must be hoping that Britain will be spared if the euro crisis worsens. To paddle your own canoe means to act independently and decide your own fate. The Phrase Finder has an interesting article on the origin of this expression.